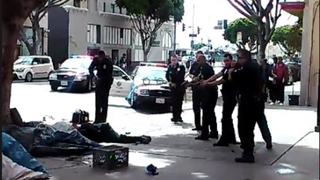 Several Los Angeles police officers stand with guns drawn over a homeless man who was reportedly shot some five to seven times March 1, 2015, during an altercation with police. On Sunday, footage of a homeless man being shot and killed during a confrontation with Los Angeles police was posted to several social media sites and has many viewers wondering if the incident merited lethal force. The graphic footage shows an unidentified homeless man—who, witnesses told the Los Angeles Times, went by the name "Africa"—involved in a struggle with several officers in the Skid Row section of downtown Los Angeles. The footage starts with what appears to be several officers trying to apprehend the man. During the melee, an officer drops his baton. A woman standing nearby picks up the dropped baton and is rushed by two officers and placed in handcuffs. It appears that one of the police officers yells, "Drop the gun. Drop the gun." At least one officer appears to shoot several times at the man, who is still on the ground with several officers surrounding him. People gathered can be heard screaming and gasping in disbelief. According to the Los Angeles Times, "Police have not identified the dead man or said how many officers were involved, or how many shots were fired," but at least five shots can be heard on the recording. The newspaper notes that the man was taken to the hospital, where he was pronounced dead. According to the Los Angeles Times, officers were responding to a robbery call, but it is unclear if the homeless man was connected to the alleged robbery or if the incident was separate from the reported call. Dennis Horne, 29, told the Los Angeles Times that Africa was involved in a fight inside his tent. When police arrived, Horne said, they ordered Africa out of his tent and he refused. Horne told the newspaper that they used a Taser on the man and dragged him out of his tent, where he continued to resist, which led to the shooting. "It's sad," Horne told the newspaper. "There's no justification to take somebody's life." Lonnie Franklin, 53, told the newspaper that although Africa was fighting with the officers, police did not need to go "straight to lethal force." One witness, who didn't want to be identified, told the Los Angeles Times that he saw Africa reach for the weapon of one of the officers and added that the police fired at least seven times. Police Commission President Steve Soboroff told the newspaper that he saw the video first on social media and added that he has watched it several times since. He said that the key issue will be whether the man did, in fact, try to reach for the officer's weapon. He added that the Los Angeles Police Department and "independent inspector general and the district attorney's office would all investigate the shooting 'very, very carefully,' " the Los Angeles Times reports. "Of course I would encourage people not to rush to judgment. It's not fair to anybody. It's not fair to the family of the victim or the victim or the officers," Soboroff told the newspaper. "We'll find out what happened."